Bryan, Holly, and Mike get together to talk about all the recent Star Wars news that came out of San Diego Comic-Con and his experience there in full, including a full report on the court-martial of Poe Dameron and the new books announced. Then, we switched gears to discuss the new Episode IX news that came out this week. We talk about all these developments and how exactly Carrie Fisher's footage might be used in the film. 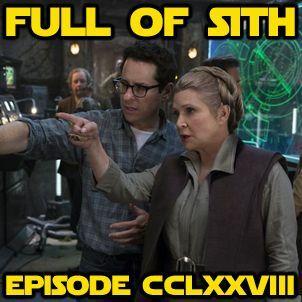 If you haven't already, join our new Facebook group and join ... Maggiori informazioni in the discussions with us and other listeners at – http://facebook.com/groups/FullofSith If you like the show, please leave us iTunes/Stitcher reviews and share us with your friends and family! We'd greatly appreciate it.